Since the beginnings of civilisation, people have used contraception to prevent pregnancy. Access to effective contraceptives is key to women’s well-being and autonomy – family planning reduces women’s health risks, decreases infant mortality, reduces the incidence of abortion, and slows population growth. Some types of contraception, such as condoms, also help prevent the transmission of HIV and other sexually transmitted infections. To find out more about contraception trends across the globe, we analysed data from a UN report that surveyed married or in-union women of reproductive age about their contraceptive use. How has birth control changed between 1994 and today? And what are the current contraception trends on every continent and in every country? Keep reading for important information about an issue that matters to all of us. However, despite the striking increase, Africa has by far the lowest percentage of women using birth control. Although limited access and cost are barriers, the main reasons behind limited contraceptive use in sub-Saharan Africa are opposition to using birth control and concerns about contraceptives’ effect on health. A 2015 study found that some areas of Africa experience a high prevalence of myths regarding family planning (such as “Contraceptives can harm your womb”). The study authors concluded that education programs and discussions to help dispel misconceptions could assist in increasing birth control prevalence. In South America, birth control prevalence increased by 14.6%, and Asia saw a 10.6% increase. Three continents experienced minimal change in contraceptive use rates: In Europe, usage increased by 0.3%, in North America it decreased by 0.3%, and in Oceania it lessened by 1%. North America still has the highest contraceptive prevalence of any country, at 74.8%. South America follows closely at 74.6%. The maps above convey each country’s top fertility method (among married and in-union couples) in both 1994 and today. Numerous shifts occurred, especially in the regions that also experienced changes in contraceptive prevalence. Based on data from the CDC, we looked at effectiveness rates for typical use of the top birth control methods used in various regions. In certain areas of Asia, female sterilisation (99.5% effective) is no longer the most popular method of birth control. Instead, IUDs (99.2% to 99.98% effective) are the top method in China; male condoms (82% effective) reign in Korea; and oral contraceptives – also known as “the pill” – take the top spot in Thailand. The pill is 91% effective with typical use but over 99% effective when used correctly, according to the NHS. In Iran, the withdrawal method (78% effective) replaced the pill for most popular type of contraception. 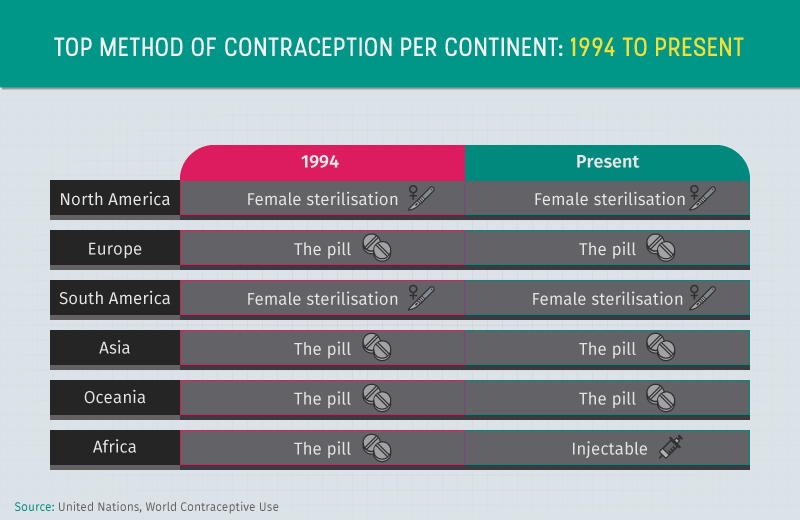 In Africa, the pill decreased in popularity overall, as did the rhythm method, while injectable birth control (94% effective) became more prevalent – especially in southern Africa. In South America, injectables overtook the rhythm method in Peru and Bolivia. In Canada, male sterilisation (99.85% effective) replaced female sterilisation as the top method. In Russia, male condoms replaced IUDs. In some countries in Central and Eastern Europe, the male condom surpassed the withdrawal method; however, withdrawal is still common in parts of Southern Europe and Western Asia. When it comes to birth control methods, favourite methods for married and in-union couples vary from country to country. 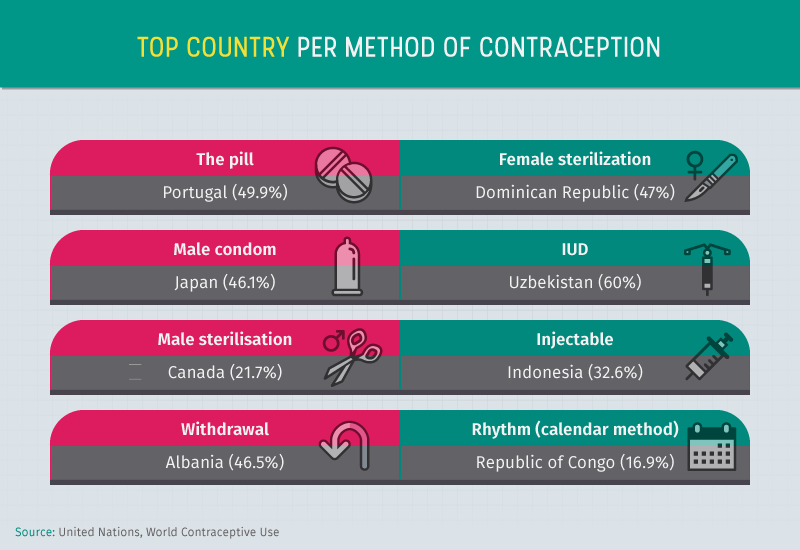 Overall, one trend is prominent: Short-term methods are more common in Africa and Europe, while permanent and long-acting reversible contraception methods are more popular in North America and Asia. Female sterilisation is the top choice in the United States and northern South America, male sterilisation is preferred in Canada, and IUDs dominate much of Asia. The pill is popular in Western Europe, Australia, several countries in Africa, and the southern part of South America. Male condoms are the top method in Russia, much of Eastern Europe, and some countries in Africa, among others. Injectables are the top choice in parts of Africa. When it comes to the least effective (and cost-free) methods, Africa is the only continent home to countries where the rhythm method is still a top choice. But the withdrawal method dominates in a swath of countries across Southern Europe, Southern Asia, and Western Asia. Why is there such a discrepancy when it comes to global usage of short-term and long-term birth control methods? The higher initial cost, dependence on providers for information, and provider bias are all cited as reasons for the underutilisation of long-term reversible birth control methods such as IUDs in certain countries. Additionally, in many areas, couples have limited access to family planning services, limited choice of birth control methods, and poor quality of available services. Other hurdles include cultural or religious opposition, fear of adverse effects, and gender-based barriers to obtaining birth control. 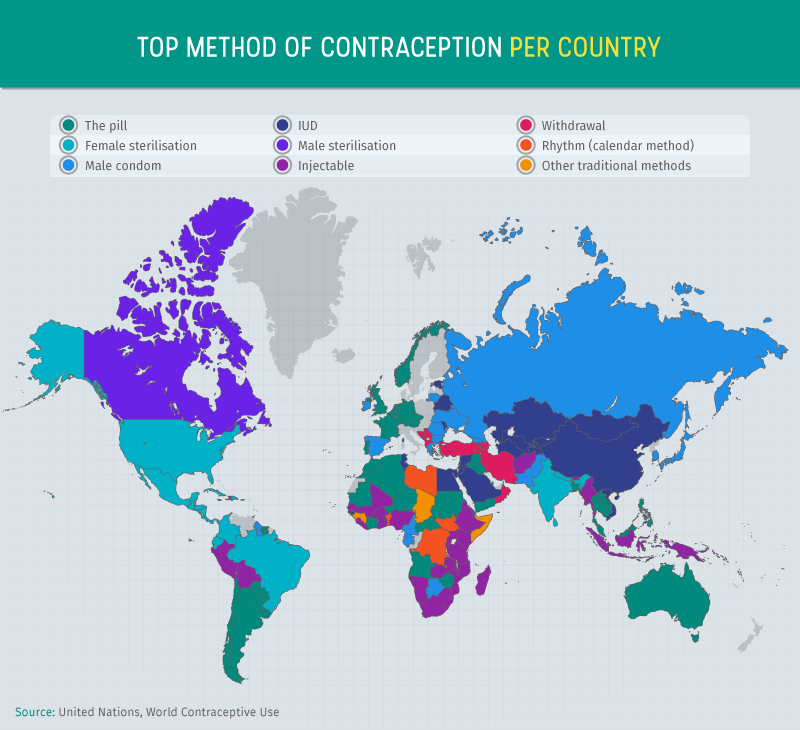 Now that we’ve examined top birth control methods in specific countries, let’s take a look at the most popular birth control method for married or in-union women in each continent overall. Between 1994 and today, 5 of the 6 continents we looked at did not experience a change in the most popular method. Only Africa now has a different top method – injectable birth control rather than the pill. There are several possible explanations for the surge in popularity of injectables in Africa. This method is convenient and requires few visits to the clinic, it does not require taking a daily pill, it suppresses periods, and it is a discreet method that women can hide from their partners or family members who don’t approve of contraception. The UN report we examined revealed that 63.6% of married or in-union women around the world rely on some form of birth control, while 36.4% report that they do not use contraception. Among women who do use birth control, long-term methods are the two most prevalent: Female sterilisation, employed by 19.2% of women, is the most common method worldwide. The No. 2 method is the IUD, used by 13.7% of women. Less common are short-term methods of birth control: 8.8% take the pill, 7.7% use male condoms, and 4.6% use injectables. The two least reliable methods – withdrawal and the rhythm method – are employed by 3.1% and 2.6% respectively. Only 2.4% of couples choose male sterilisation. Female sterilisation and male sterilisation are fairly similar: For women, the Fallopian tubes are cut and tied off, while for men the vas deferens, or sperm duct, is cut and tied off. Interestingly, although female sterilisation is much more prevalent on a global level, studies show male sterilisation may actually be a better choice in some cases. According to one study, vasectomy is 30 times less likely to fail and 20 times less likely to prompt postoperative complications than the operation used for sterilisation in women. However, some countries have few trained providers who can perform vasectomies compared with doctors who are trained in performing female sterilisation. Zooming in on the breakdown of contraceptive methods in every continent paints an intriguing picture. Without exception, married and in-union women who use no birth control comprise the largest proportion in every continent. Among women who do use birth control, the female sterilisation method dominates on three continents: North America (20.6%), South America (22.6%), and Asia (23.7%). Female sterilisation is much less common in Europe (3.7%), Oceania (8%), and Africa (1.6%). 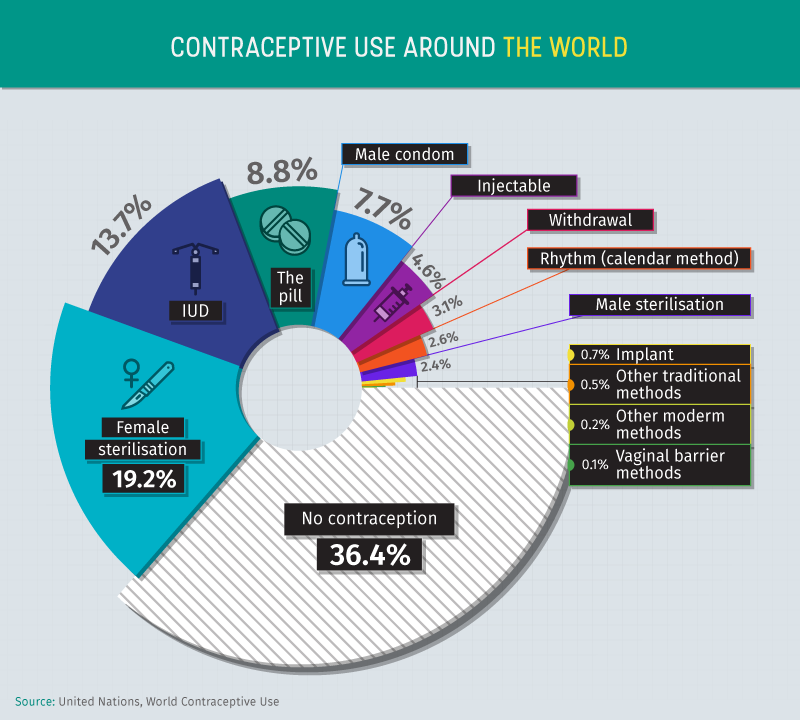 Asia has the highest proportion of IUD users (17.4%), followed by Europe (11.3%). The pill is the most common method in Europe (21.9%) and Oceania (21.6%). In Africa, injectables are the most common method (9.8%), and the pill is second-most popular (8.7%). One surprise: Europe has a higher prevalence of withdrawal than any other continent: It’s the birth control of choice for 7.8% of couples despite being one of the least reliable methods. Various contraceptive methods have unique benefits and drawbacks. Some methods have surprisingly low efficacy rates, such as withdrawal (which has a 22% risk of failure) and the rhythm method, which has a 24% risk of failure. We grouped more effective and less methods to analyse the breakdown of use by married and in-union women on each continent. 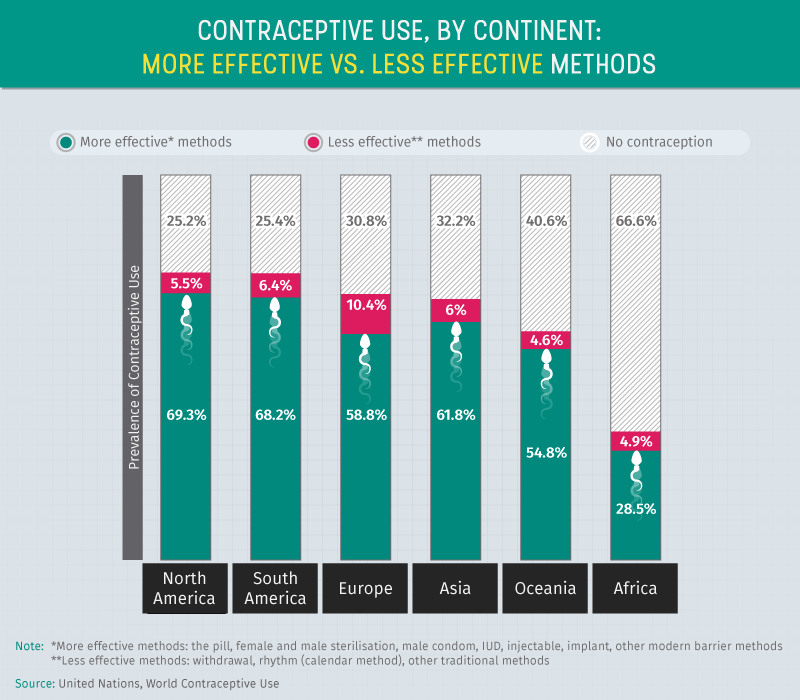 Surprisingly, among every continent, Europe has the highest rate of use of the less effective contraceptives: 10.4% of women choose less reliable birth control methods. South America comes second for less effective methods (6.4%), Asia takes third (6%), and North America comes fourth (5.5%). Oceania has the lowest rate of less effective birth control use (4.6%), followed by Africa (4.9%). However, Africa’s 66.6% rate of women who forgo any birth control (technically the least effective method) dwarfs the other statistics. 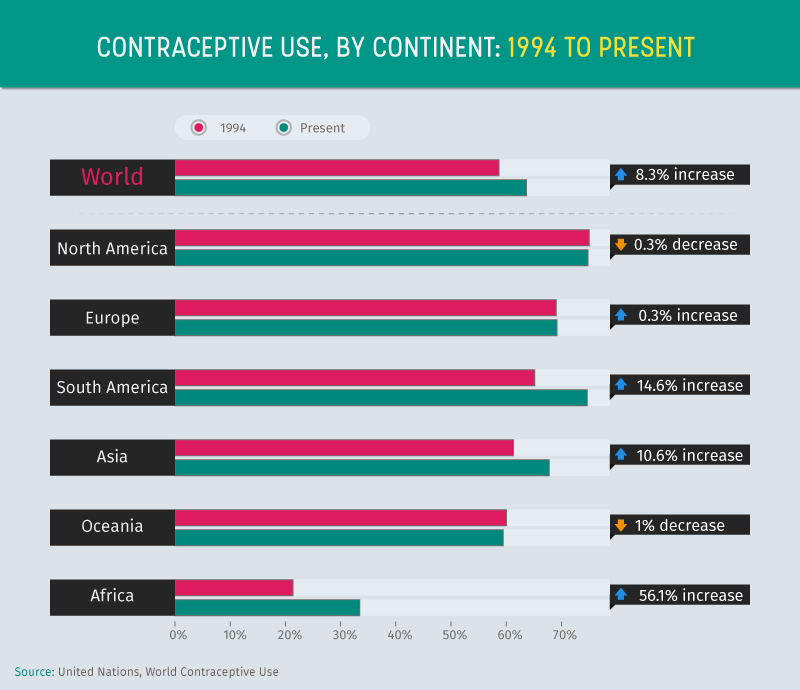 North America has the highest rate of usage of the more effective contraceptive types (69.3%), followed by South America (68.2%) and Asia (61.8%). 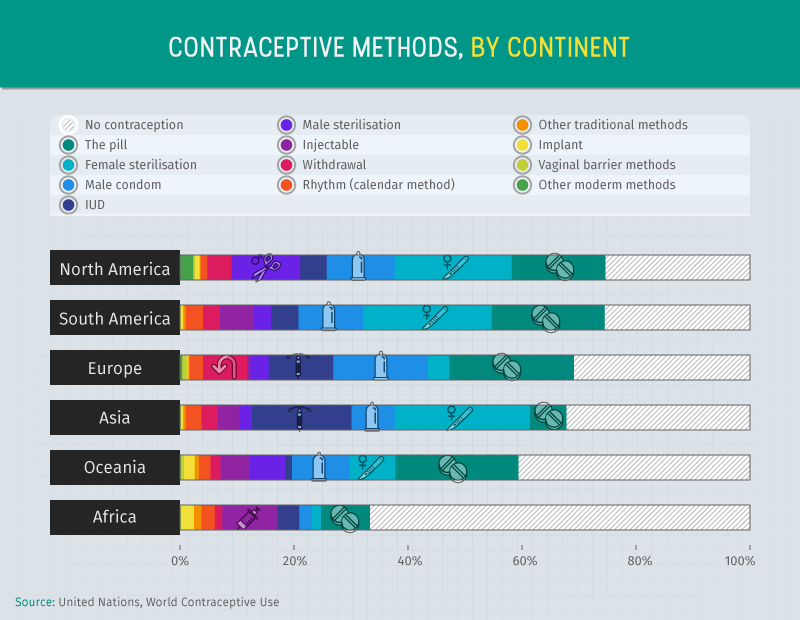 At the bottom, Africa has a 28.5% rate of the more effective contraceptive methods. Next, we took a closer look at more effective contraceptive use by married or in-union women in specific countries. 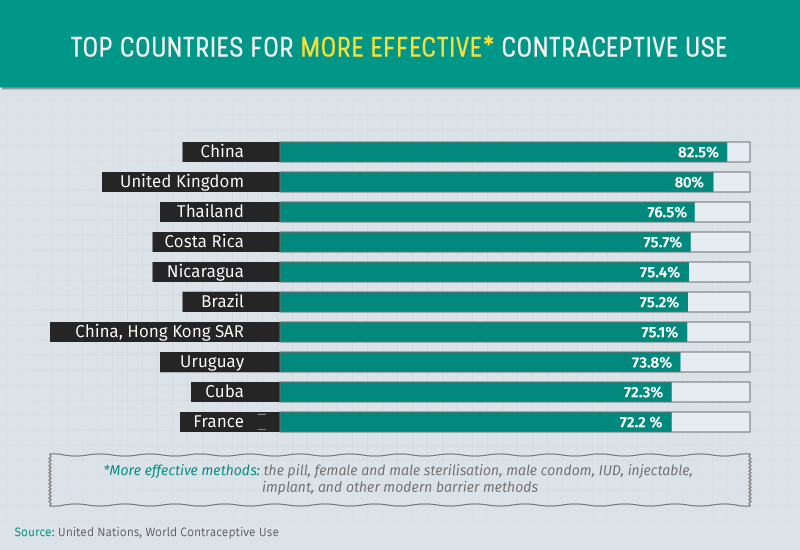 Though Asia straggled behind North and South America for more effective contraceptive use by continent, China claims the top spot of any country: 82.5% of in-union women opt for more effective methods. Although its rules have recently changed, the country has a well-known history of having a one-child policy. This could help explain the focus on reliable contraceptives. The U.K. comes in second for usage of more effective birth control methods. In recent history, the U.K. has made great strides in reproductive health, and the region continues to emphasize the need for clinics to improve services and involve, consult, and listen to patients. In third-place Thailand, a family planning effort that began in 1970 slashed population growth there. The campaign spread awareness of the once-taboo topic in a variety of ways, and it’s safe to assume its legacy still resonates. When it comes to the prevalence of less effective contraception usage among married and in-union women, 9 of the 10 top locations are economically developing countries. Only No. 10 Greece is not. 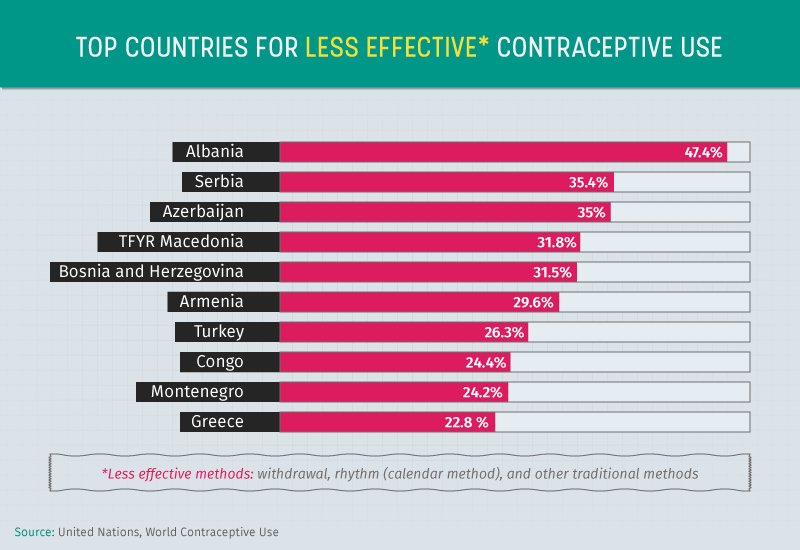 In first-place Albania, the government actually banned contraception until 1992. Although the country’s birth control use rate is not as low as some, its reliance on less effective methods is striking: A study in 2008-2009 found that 58% of married women relied on withdrawal to prevent pregnancy, while only 11% used a more effective method. In second-place Serbia, where sexual education was virtually nonexistent, withdrawal was historically the favoured birth control method. Why? It required no physician and supported the active sexual role of the man as dictated by culture rather than provoking conflict between couples. As a result, Serbia has a long history of a high prevalence of abortions: A 2012 WHO report revealed Serbia saw 323 abortions for every 100,000 births. To put it in perspective, the average rate of abortions among EU member states was 226 per 100,000 births. Breaking down locations with the highest prevalence of use for each birth control method yields some surprises. In Uzbekistan, a full 60% of married and in-union couples rely on an IUD for birth control. During the country’s Soviet period, contraceptive knowledge was minimal, and abortion rates were high. Warnings about the risks of hormonal contraceptives coupled with medical media’s advocating the IUD sent usage skyrocketing. By 2002, 73% of married women in Uzbekistan reported having used an IUD, compared with only 14% who had used the male condom and 13% who had relied on the pill. Clearly this tendency has prevailed. In Portugal, 49.9% of married or in-union couples rely on the pill, which doesn’t require a prescription and can be procured for free in health centres around the country. In the Dominican Republic, 47% of couples choose female sterilisation. In Japan, where the birth control pill was illegal until 1999, 46.1% of couples use male condoms. In 1994, Japanese people bought twice as many condoms per person as Americans. The interactive feature above offers a colourful visual representation of the prevalence of each contraceptive method across the globe. Select a contraceptive type to see its prevalence in every country. Reproductive autonomy is a basic human right: Everyone in the world should deserve to decide the number and spacing of children they have. However, for women in some parts of the world, decisions about birth control have historically been out of their hands and instead driven by government policies within their country or region – including forced sterilisation policies, illegalisation of certain contraceptive methods, and population-control programmes. This study reveals that while the world has come a long way when it comes to family planning, access to diverse and affordable contraceptives varies greatly by region. Clearly, there is still further work that must be done to bring education, accessible contraceptives, and reliable health care services to all corners of the globe. At Superdrug Online Doctor, we hope to empower you to take positive steps when it comes to your sexual health. Your body and your reproductive decisions are yours alone. From the privacy of your own home, you have access to safe and effective contraceptives, as well as STI test kits and treatments. To learn more, visit here.